Language: English, and Deutsch, Spanish, Français, Italian, 한국어, Polski, Русский, 繁體中文. 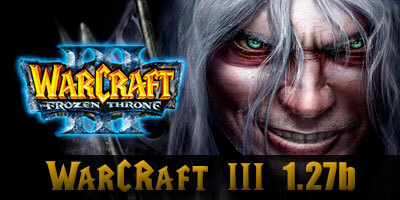 Blizzard Entertainment release the new warcraft 3 patch 1.27b (1.27.1.7085) for The Frozen Throne. – Warcraft III The Frozen Throne any version. – Raised file size limit from 8mb to 128mb. I.- Download the War3TFT_127b_English.exe file, and Run the downloaded file to install it. NOTE: You need to install the patch as an administrator, you can right-click on the War3TFT_127b_English.exe file and select Run as administrator. I.- DotA Map is not Working? You need Download latest dota map DotA 6.83d, DotA 6.88v3, DotA 6.85k for RGC. 2.- DotA Ai Map is not Working, Download the latest dota ai map DotA 6.83d Ai or DotA 6.88 Ai, 6.88 ai doesn’t work with 1.27a or before version (Show the error message “the map file is too big. Please choose a diferent map”). Download Warcraft III Setup or WC3Fixer and fix, please read the instructions. 4.- Error with loader PvPGN (w3l.exe): patch error (wc3lh.dll) Could not find location to patch. If you play Warcraft III or DotA on PvPGN Server (Private Server), Download: PvPGN Loader 1.27b. I installed the 1.27b patch, started the game, put a map to play and it just exits the map in my lobby. Now I cant play any other map either..